Visitors explore the inner workings of TVA's nuclear plants via surrogate travel. Click here for details about the TVA Nuclear Information Center. 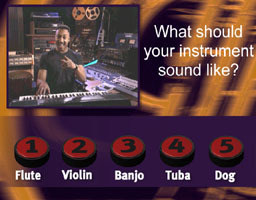 In the Digital Jam sound booth, three visitors play MIDI instruments under the direction of a video host. As their performance is replayed, visitors can change the sounds of their instruments. 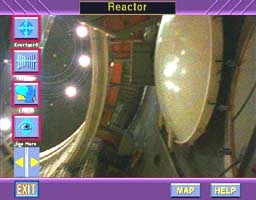 Click here for more examples from the California Science Center. 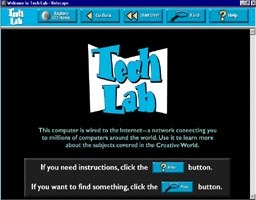 At the California Science Center's Life Lab and Tech Lab, visitors use a custom designed front-end to explore Internet websites recommended by the museum curator and to access CD-Rom titles. Six contestants compete for the title of Water Wizard by demonstrating their knowledge of Alabama waterways. The set has all the paraphernalia of a TV game show including an emcee (on videodisc), video cameras, multiple monitors, and custom designed contestant pods.